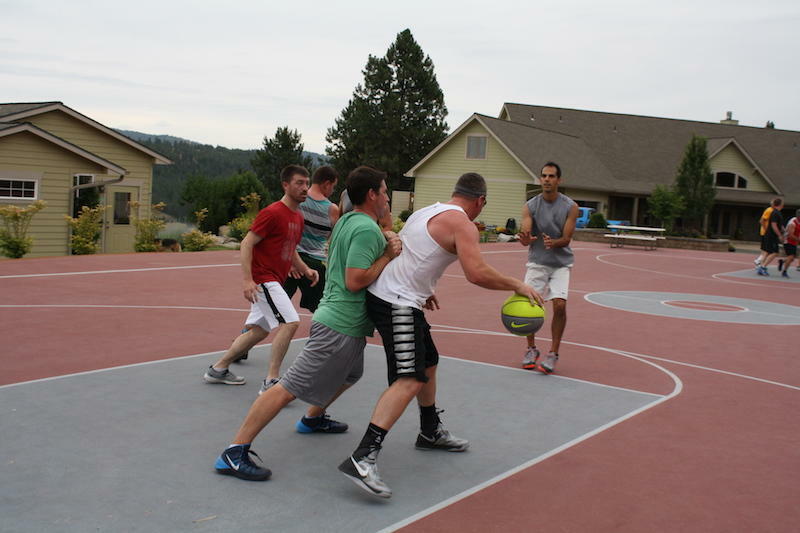 Teams practice a few days before Hoopfest, an annual basketball tournament in Spokane. Public health officials are concerned about several major athletic events in the Northwest this weekend. A heat wave could push temperatures over 100 degrees in much of the region. But that’s not stopping thousands of athletes scheduled to compete in the Inland Northwest, Willamette Valley and eastern Oregon. Teams are practicing for Hoopfest, the annual three-on-three basketball tournament in downtown Spokane. Jeff Fischer is one of about 25,000 people set to compete on courts set up on the city’s glistening asphalt streets this weekend. “There’s nothing like it in the world,” he said. And how he plans to cope with the heat? “I think if you’re careful and hydrate it shouldn’t be a problem,” Fischer said. But county health officials say the record temperatures in the forecast are a recipe for heat stroke and exhaustion. Hoopfest organizers are bringing in extra water and misters. Across the Idaho border, the Coeur d’Alene Ironman triathlon will start half-an-hour earlier at 5:30 a.m. in order to beat the heat. That event involves swimming two and a half miles, biking 112 miles, and running a full marathon -- all in temperatures that could reach 107. And in Eugene, organizers of the USA Track & Field Championships rescheduled the men’s and women’s 5,000 and the junior men’s 10,000 meter events to cooler morning times. Cyclists competing in the Baker City Classic have been told to prepare for temperatures over 100 degrees in eastern Oregon. Organizers of the event ordered several hundred extra bottles of drinking water and plan to give out additional water mid-race just for cyclists to dump over their heads.